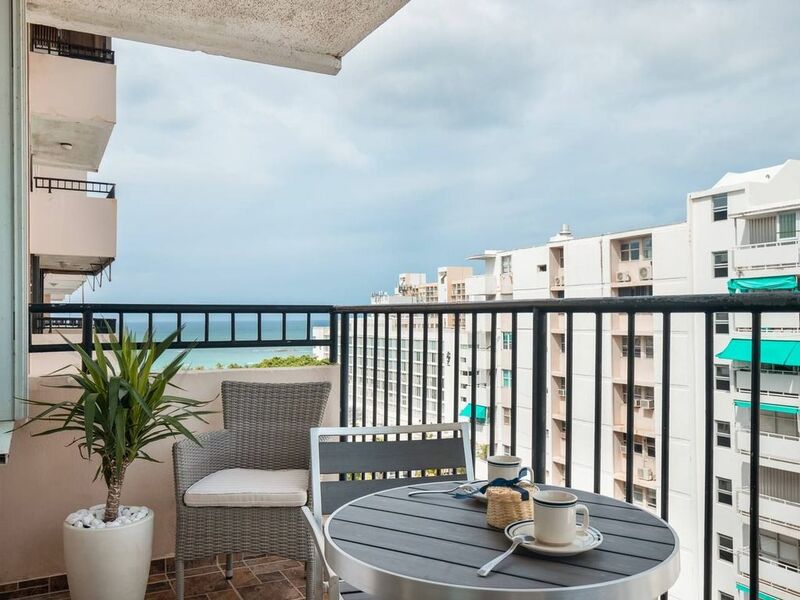 This apartment is located in the heart of the Isla Verde area, in front of El San Juan Hotel& Casino and the Intercontinental Hotel& Casino. The apartment is very big with 700 square feet of space.Has a fully equipped kitchen, one huge bedroom with a Queen Bed, one full bathroom, living & dinning area, balcony with ocean view and has full a/c. The living-dining is huge with glass doors overlooking the balcony with partial beach view. The apartment also offers underground parking. Best location. Across the street from the Intercontinental Hotel & San Juan Resort & Casino. Is only 5 minutes from the Airport. Two Tv. One LCD 32' Tv in the living area and the oher LCD 20' tv in the bedroom. In a very nice appartement at 10 minutes from the airport and walking distance to beautiful hotels, restaurants, convenient stores and the beach. I would definitely recommend . Not on the beach but close enough to it. Very conveniently located. Apt was clean and in good condition. Checking was very smoothe. Awesome!!!!!! Great location!!! Great Property!!! Can't wait to go back!!! This property is located close to everything. Easy access from the airport; less than 10 minutes ride... Love the amenities of the property, EXTRA CLEAN!!! loved it!!!! Planning my next trip n definitely will stay here again!!!! The Property was exactly as described on the Listing. The owner, David Soto was very accommodating and a pleasure to work with. When we arrived, the A.C.was on and we felt very comfortable and relaxed. We enjoyed very much the on site Pool and Patio. The Security and Employees were excellent. The on site Parking and Laundry room were an added bonus. The Beaches, Restaurants, and Retail Shopping were all within walking distance. We had a Great time. Thank you David Soto, we look forward to future visits. Great place in the middle of Isla Verde. The apartment was very clean, with all the amenities you would need to enjoy your stay in Puerto Rico. It is close to many restaurants, casinos, and what is most important to me some of the most beautiful beaches on the island. I recommend the apartment for a couple or even a small group or four. I truly enjoyed my stay there and in the future would stay there again. The only couple of things that I found were that the balcony needs some work as the concrete is cracking and missing a small chunk and the light in the fridge was not working and the towel hangers in the bath kept falling off, but like I said this are small items quickly corrected and will not distract fromm you having a great time in David's place and in Puerto Rico in general. Our stay was awesome! This condo has everything you need and is located near everything! It was clean and comfortable. David was a pleasure to rent from!